2. "Mah Nishtanah/What is the difference..." -- Tonight is reviewed/repeated (nishtanah) our attachment to Moshe Rabeinu/the Tzadik haDor, who is MaH, as it says, " וְנַחְנוּ מָה/ve'nachnu MaH/we are what"? (Ex. 16:7) This also permutes as נחמן הוו/Nachman haVaV -- Nachman is the Vav, i.e. 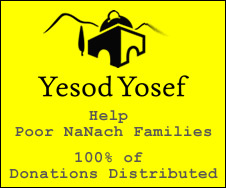 the Tzadik Yesod Olam. MaH -- Mem He -- Take our water, take our Torah. MaH -- Me-Hei -- from the Hei -- al pi kabbalah the middle matza, seen as a letter Hei, is broken into a smaller piece shaped as Daleth and a larger piece shaped as Vav, the latter being hid as the Afikoman. Seems to me this is Moshe Rabeinu from shevet Levi, i.e. the Tzadik haDor (as is known, the the three Matzot stand for Kohen, Levi, Yisrael). Moshe Rabeinu is the secret, he is hidden, his grave is hidden, the Tzadik is still hidden. But he's coming back, so the Afikoman comes back -- Az Yashir Moshe -- Then, in the future (to sing the new song Y YK YKV YKVK, Tikunei haZohar #21, daf 51b; hinting to the Resurrection, Sanh. 91b, Mechilta, and as brought by Rashi in Ex. 15:1). And this goes with the pshat of the Ramban et. al. that the afikoman is a commemoration of the Korban Pesach, as it has already been counted that Pesach=148=NACHMAN. And indeed, TZAFUN, BAREKH, HALLEL -- when the hidden Moshe returns, we bless and sing! So may we merit to the New Song speedily in our days. Happy Pesach! N NH NHM NHMN. P.S. Overheard in a conversation here... "..Which Rebbe?" "There is One Rebbe. Hashem is One? So there is One Rebbe."